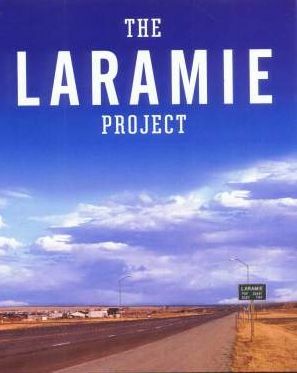 People always seem incredibly surprised when they find out I had, until recently, never seen The Laramie Project. I’m big on gay rights, extreme violence irks me more than almost anything else on earth, I’m a sucker for life-based theatre and I even grew up in a small town that made national news because an innocent kid died at the hands of a couple of idiot town bullies (not Laramie, I swear). But I’d just never made it to the show. I’d heard of it, of course, and knew the basics of the horrifying Matthew Shepard story, but I feared the play might be too preachy, too victimizing, too traumatized by its own content to realize that it’s now 13 years old. So when I travelled to the Toronto Centre for the Performing Arts to see my very first Laramie Project, I had years of expectations. What I found at Encore Entertainment’s recent production was a group of passionate amateurs (read: people who are teachers and cops by day, performers every once in awhile) telling a shocking story in unsurprising ways. There isn’t a lot of interpretation room in the Laramie script, so Mario D’Alimnonte’s contribution to the production rested in its solid pacing and reassuring simplicity. 21-year-old Matthew’s story (of his 1998 beating and death in the Wyoming town of Laramie) stands on its own to create an engrossing and affecting play no matter the production, and while I do think the script would greatly benefit from the inclusion of some of the story’s more complicating details, there’s no arguing that it doesn’t captivate audiences by triggering responses from extreme sadness to outrage to guilt with the occasional moment of hugely welcome humour. I might argue that, 13 years after the fact, we need new stories (or, better yet, a world that doesn’t necessitate telling them) and that the statute of limitations on this play significantly altering perspectives has run out. There’s a certain “preaching to the choir” effect that a Laramie production understandable has; but, luckily, the choir are also the people most willing to look past any technical or storytelling flaws to the emotions underneath. The cast itself was generally pretty strong for a small-scale, all-volunteer company. The difference in polish was unmistakable (to me at least, the smitten audience seemed quite convinced that this was the greatest cast that had ever tread the boards) but the level of commitment in the performances of these 8 actors- each playing more than a few different roles- elevated them substantially. My favourite was Graham Fleming, who played the eccentricities and heartrending Act II arc of the town sheriff with great subtlety and gave voice to one of the play’s great standout characters- the Catholic priest whose message of love and tolerance did more than anything else to counterbalance the hate present in the story. I also loved Aaron Sidenberg as the guilt-ridden bartender who was the last person to see Matthew alive (complete with beautiful anti-death penalty speech) and Derrick Evans in all his roles (though, specifically, as Matthew’s heartbroken, scared, proud, furious and fundamentally good father). Luke Slade’s take on the more brutal of the two murderers (the other was played with haunting silence by Fleming) was terrifyingly cold, the cure for his earlier broad portrayal of the bar owner (his exuberant performance as an aspiring actor just starting to recognize his own prejudices fell somewhere in between excellent and maybe a bit much). As for the women, Monique Renaud was my least favourite of the cast, relying more on caricature to differentiate her roles than the others seemed to, and Lucy Eveleigh’s accent sometimes distracted (most notably when she tried to cover it up), but she moved me almost to tears as the frightened college professor trying to hold back her own. Alissa DeGrazia was probably my favourite among the women with her multiple well-defined performances (my favourite: the well-meaning but somewhat gruff police officer who found Matthew and was put at risk of HIV in helping him) but it was Avra Fainer who played the character that really got to me: Matthew’s friend who organized a group to surround hateful protesters at the trial, blocking them from view with angel wings. I cry at kindness and hope far more than I cry at tragedy so that was the anecdote that broke me down, and Fainer played it with just the right amount of coy congratulations that it made me grin a bit too. In the talkback after the show- mostly populated by school teachers- the audience related to the piece perhaps a little too overtly. In their empassioned pronouncements, the speakers made Matthew’s story about them and their political beliefs (religious ones too- the women behind me almost got in a shouting match over their love/resentment of The Bible), hardly making room for the artists on stage to speak about living with this play through rehearsals and the run. But what they did manage to get in edgewise was the fact that some of the citizens of Laramie whose likenesses appear in the production had reached out to them to say how proud they were to see The Laramie Project live on. And while I’ll probably never see the play again- it’s not a strong enough piece on its own to merit return visits-, in the hands of this dedicated ensemble, Matthew was certainly well represented.